Little People. 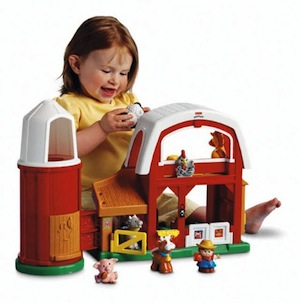 With fun animal sounds all around and plenty to do, little ones will discover what a busy place the farm can be. Then, as toddlers grow, they'll learn about life on a farm that's just their size, with Farmer Jed™ and his animal friends! Includes Farmer Jed, cow, sheep, horse, pig and goat. Requires 3 "AA" batteries. Includes free sample DVD with three charming stories inside! Ages 1-5 years old.